The Ireland international is one of four nominees for the player of the month award. Aiden McGeady has been in excellent form in the Championship. 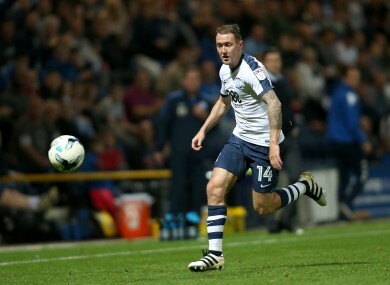 AIDEN MCGEADY’S EXCELLENT form for Preston has been recognised with a Championship player of the month nomination. The 30-year-old has impressed since joining the club on loan from Everton in the summer transfer window, and the winger has been excellent in particular over the past month, producing three goals and four assists. McGeady is one of four nominees along with Huddersfield Town’s Izzy Brown, Brentford winger Jota and Kenneth Zohore of Cardiff City. Meanwhile, the former Celtic player’s boss Simon Grayson is up for the manager of the month award, after guiding Preston to a five-match unbeaten run and keeping them in contention for the playoff spots. He faces competition from Huddersfield boss David Wagner, Fulham’s Slavisa Jokanovic and Newcastle coach Rafael Benitez. McGeady features among a strong Irish contingent at Preston, with Daryl Horgan, Alan Browne, Greg Cunningham and Andy Boyle — who made his senior debut earlier this week — also considered important squad members. The winners of the awards will be confirmed tomorrow. Email “Aiden McGeady's superb Championship form has been recognised”. Feedback on “Aiden McGeady's superb Championship form has been recognised”.